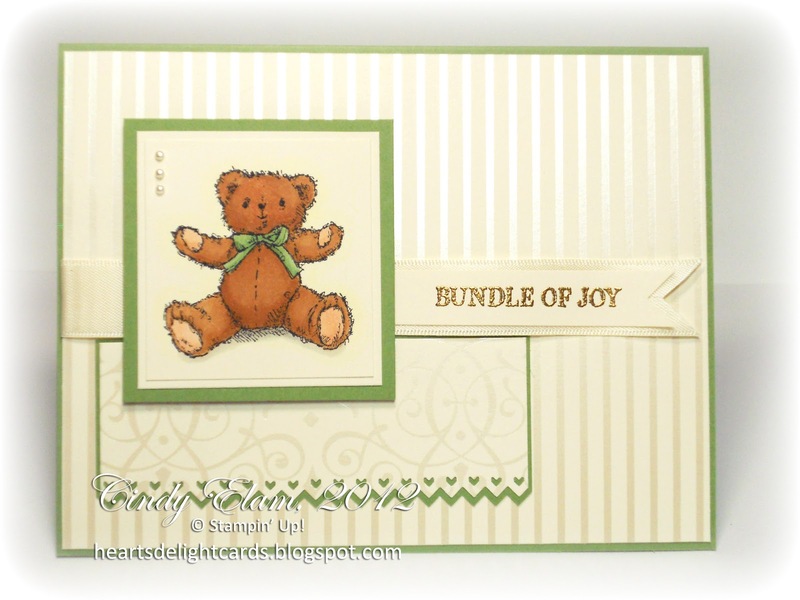 Another baby card completed this weekend! I had forgotten all about Teddy & Train until I went through the box of retired stamps. 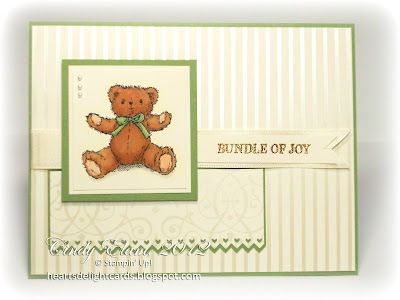 In trying to make a gender-neutral card, I had to forgo the cute little train, but the teddy bear was perfect. It was colored with Copic markers, because I really wanted to blend the colors - the paper it was stamped upon had to be Very Vanilla to match the DSP. Kind of hard to blend regular ink without making the paper pill up and get all wonky. I'm always sorry to see stamp sets retire, but also excited to see what new ones will be coming out. Yes, I am conflicted that way. (Some might say psycho, lol.) We only have five days left of Sale-A-Bration, and about five weeks left of the Occasions Mini catalog. Then those stamps will be gone, gone, gone! And all the lovely Designer Series Papers. *sniff! * Though I gotta be totally honest; those gnomes will not be missed by me at ALL. I love this adorable card Cindy. Great layout. Another adorable card Cindy! I love it. HAHAHAHA! Cindy, I have to agree wholeheartedly with you about the gnomes, I will not miss them either. However, I do have a customer who would love to see more (yipes) gnomes. The card is very stunning. What a great idea to gold emboss, very elegant! Such a lovely card! Baby cards are so fun to make. Oh my gosh--so very cute!